Murphy Varnish Company, both by the volume of its business and the quality of its products, is a manufacturing concern which reflects credit on the City of Newark. The business was founded in 1865 by Franklin Murphy, who has efficiently served in the capacity of chief executive since its inception. At first the company made varnish alone - but a few simple kinds of varnish. From time to time they added other lines of manufacture - Japans and surfacers and Japan colors and oil colors and enamels and stains and Konkreto, until they now put forth a complete list of finishing materials for everything that is finished with a brush. Their great customers are railway and marine companies, architects and builders, carriage and motor car and piano and furniture manufacturers - but they provide the finishing materials for about everything that is made of wood and steel and leather, and for many things besides. They put out more than two hundred kinds of varnishes and about twelve hundred shades of color, with a like completeness of products in all other braches. 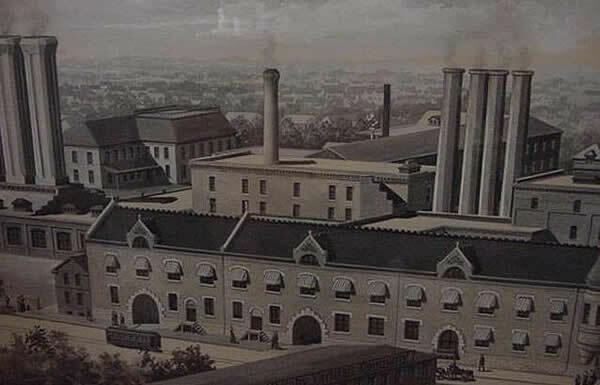 The home factory in Newark has grown to nearly the size of three city squares; and the establishing of several other factories in Chicago and Cleveland and Montreal. "First, I must provide ingredients of the best quality with which to make the goods - there must be no cheap substituting, for the sake of selling at a lower price. "Second, I must provide a plant which would be as nearly perfect as it was possible to devise; and I must adopt all improvement in facilities and methods as increasing business and experience demanded. "Third. Most important of all, I must secure a working force, every member of which, in office and laboratory and sales department and process work, should be an enthusiast for Murphy Varnish Company; always alert to do the best thing in the carefullest way - must pay them so well and threat them so well, and give them such chances for special rewards and for promotion, that they would be satisfied." From the start the interests of the employees have been thoughtfully looked after and they have responded by giving loyal and devoted service. A number of the employees have been with the company more than thirty years and a number more having reached the age of seventy have retired under the Company's pension system. It may be fairly claimed that no other manufacturing industry in Newark has done more than the Murphy Varnish Company to make the city widely known. Its advertisements have appeared systematically in journals of national prominence, circulating in every village in the United States. Its traveling staff visit at regular intervals every town in the country of a thousand population or more, and many towns numbering even less. The important cities of Europe are also cared for and several of its important brands can be found on the dealers' and consumers' shelves abroad, with the company's labels printed in the language of the country, heralding the name of Newark.